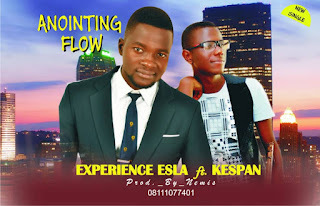 Gospel music minister EXPERIENCE ESLA is finally out with another Holyghost filled worship song ANOINTING FLOW after the release of his album “COMING OF THE KING” early this year in March. This new tune features an award winning gospel music artiste KESPAN. Anointing flow is a song that expresses true worship to God and eagerness to receive Gods Anointing.